We've arrived in chilly Banff. The good news is the hotel room is cosy. The day started around 8am when the bus departed Vernon and travelled along the Okanagan Valley towards the Rocky Mountains. Our first stop was at Craigellachie to view a monument marking the spot where the last spike was driven into place in 1885 linking Canada by rail from coast to coast. We stopped for a nice walk through a giant cedars forest and in the afternoon we crossed Rogers Pass and the narrow Kicking Horse Canyon. We saw several bears on our travels today too. Didn't get a very good picture of them though. However Tony managed to shoot some awesome video of a bear pooping. Proof a bear really does that in the woods. Just before we arrived in Banff we were taken to Emerald Lake. It's a very beautiful and tranquil lake. I remember visiting here in 1986. It's still breathtaking. It hasn't changed a bit. The town of Banff has grown from last time I was here. It's now a bustling alpine town. Luckily we're here between the end of the ski season and the start of the peak summer tourist season. If you can't achieve enlightenment, try enchantment. Jan, originally uploaded by Andrew Shepherd. I received news from Mum about an hour ago that her sister had passed away. Our family had been expecting this for several weeks. Jan was a favourite aunt of mine and had fought with chronic arthritis most of her adult life. 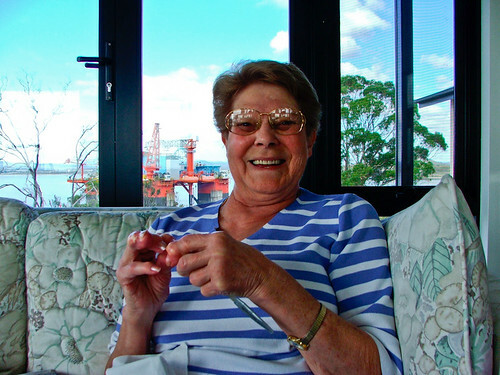 This photo is the last one I ever took of Jan, taken just over three years ago in my brothers house at Beauty Point. His house is built on the location of my late Grandfathers shack that looks out over the Tamar River. It was here I had my fondest and most vivid memories of Jan when I was a child. I'll going to miss you Aunty Jan. While I was away I had my DVR recording my TV favourite shows. When I got back from Macau I had 10 days of TV to catchup on. Well that batch took two weeks to get through... but by then I had another two weeks to view. It's only today I've just about caught up. I have only three more one hour shows to get through. I spent a few days with Tony in Hobart. The mother of a close friend of ours had died so we decided to buy some flowers and a card. The flower shop is located in a back alley and I'm waiting outside for Tony. I notice the walls are strewn with graffiti and spot a word phrase I hadn't seen before. I mention this to Tony on the way back to the car. Later on we're presenting our lovely bunch of flowers and sympathies to our friend. She gets a vase and thinks to fill it with water... or as Tony suggests "put them in root juice". I'm shocked and horrified, as Tony clearly didn't pick up the euphemism I was referring to earlier. So, girls and boys, I expect this one to be in the next edition of Macquarie Dictionary. Don't you just hate it when one of your favourite consumer products is discontinued? It happens to me quite often. This time it's my moisturiser. Yes folks, I use moisturiser (anyway it's not the first time I've admitted to it). The people at Nivea For Men have ditched the best facial lotion on the market - "Moisturising Lotion SPF15" and now I have to choose between what I consider three inferior products - "Moisturiser Sensitive" or "Rehydrating Moisturiser Lotion SPF15" or "Active Firming Moisturiser"
My skin doesn't need rehydrating or firming so I might have to settle for the "sensitive". What product will be next to vanish of the shopping shelves? 20 years ago, living on a Greek island was my mid-life crisis plan, in the event I needed an escape. Well, here I am at mid-life (46), there's no crisis, I'm very happy. What went wrong?!?!?!?!? I'm not a spiritual person. That is, I'm not religious. Occasionally I'm asked "but what about your interest in Buddhism?" Well it's all quite simple, much like Buddhism itself. I only study Buddhist philosophy. No complicated chanting, meditation or a desire to reach enlightenment. To me, Buddhism is not a religion but a system of knowledge. It's something I can do on my own. The main difference is, a religion is where you follow a dictatory path laid down by the religion. You walk the same path as others. With Buddhism I tread my own path in life. It's that simple. Why do people have to make their lives so complicated? Usually Good Friday is a low key affair but this year I invited Tony to Beauty Point to see the start of the Three Peaks Yacht Race. 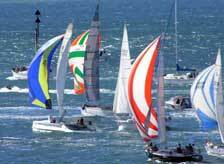 It was a rather colourful spinnaker start. Saturday Tony ventured over to my place and brought over his PS2 to try out on my plasma screen. And it was freakin' wonderful! Played Gran Turismo 4 .... and spent most of the time over correcting the steering so we ended up more off the track than on it. 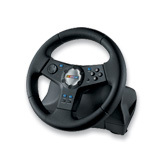 So we set off for the nearest Harvey Norman store and bought ourselves a Logitech Wheel controller each. Then we were in PlayStation bliss. Later we watched Bourne Supremacy. It's one of a few movies that deserves to have a sequel. Sunday (today) is was back to work unfortunately. However, I do have 2 weeks off at the end of this week. I feel another Hobart trip coming on. Each day I receive emails from several subscribed mailing lists, including GBOF. I read the Daily Dharma posted by Albert Kaba regularly. Like a river, experience is never the same from one moment to the next. but we tend to ignore change and emphasize similarity. Insisting that the past has gone and the future has not yet come, we turn the present into something static: a fixed and rigid identity. To counter this tendency, we can focus in our experience on how things change from moment to moment. Right now I think I am the same person that I was last year or five minutes ago, but in fact the mind, feelings and desires are constantly changing. Instead of insisting on sameness, can we simply appreciate the subtle differences? Tony and I spent new years eve at his flat in Hobart. We spent the day at the Taste of Tasmania and had a meal at The Metz in Sandy Bay that evening. Usually the done thing to do is watch the new years fireworks down on the docks. But I was sound asleep by 11pm. The fireworks did wake me up though. Each week I look forward to a new strip of Adam and Andy by James Asal. I've just taken the 'Which Adam and Andy Character Are You?' quiz and discovered I'm not my name sake but an Adam! Which Adam & Andy Character Are You? Just started 3 weeks leave today. I have lots of things I'd like to do around the house. So far I've mowed the grass. It's a good start. Sometime ago I purchased some Ken Duncan panographs and last month sent them in to get mounted in some nice wood stained frames. They rang me today to say they are ready so I'll head into town on Monday and pick them up. Yes it's my birthday. Forty four and smiling! Today I had lunch at a winery with my family and although they sat us next to the sunny window (which felt like a furnace after a while) we all had a great time. The food at Rosevears Estate was extremely tasty, I enjoyed it all... including their Unwooded Chardonnay. Each year I try to grasp the concept of Valentines Day but never quite figure it out. Anyway, happy Val's day to all those people I secretly admire.... you know who you are!!! When too much news... is never enough! I haven't launched my RSS reader (NetNewsWire Lite, btw) for about a week, so no sooner had I creamed over the announcement of The Simpsons movie, I found heaps of other newsy bits that caught my eye. - NASA officials adamantly defend the decision not to perform any more service missions to Hubble -- which means one of the greatest scientific instruments in history will die as early as 2007. - Some months ago I was delighted to see a new tv mini-series remake of an old favourite show, Battlestar Galactica. Sci Fi Channel thought it so successful they're now going to make a 13 episode series based on the mini-series. - Hey ya... Linus and Lucy lip-synching to OutKast? Hilarious! Watch the vid. Had a fun time at Tamar Cove, a little restaurant about 45 mins down the river with Tony's folks. It just happened to be the same resaurant my Mum and Dad where at too! Didn't over do the drinks, we had to drive back to Launceston. We rang our mate Michael in Sydney at midnight and watched a few "crackers" go off (nothing like the big show in Sydney though). Today I'm off to work... just as soon as I have a 'wake-me-up' shower. I have new neighbours. They moved in last Thursday. We've said hello and done basic introductions, but are they in for a shock living next to me... Mr. Don't-talk-much. No, I'm not really a snob, but I do like keeping to myself. to mention the absolute necessity of attacking this enemy diligently? A Canadian prison has cancelled a bulk order of fruit flavored condoms. Was in just in bad taste or did they actually taste bad? Every sheila that drives a car should buy one of these... a car that can park itself! Active 102-year-old Italian looking for love and marriage... promises can still deliver the goods. Tony took this photo on our recent visit to the Canberra Zoo. It totally supports the Lindy Chamberlain theory: Dingo + Baby = Lunch! It's one hour to midnight. Tomorrow I'll turn 43.